by Kenneth P. Bailey. Hardbound, 374 pages, 6" x 9". 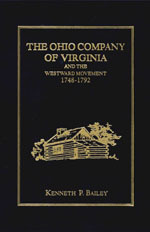 The definitive study of the Ohio Company, the largest principal land company competing for land west of the Alleghenys during the mid-1700's. A study of exploration of a new frontier and its Indian policy and problems, of colonial jealousy and conflict, and of traders and trader problems. Complete with five maps, extensive 20 page bibliography, 682 footnotes and a complete index.